Lambda the Ultimate USENIX2003: "We would like to "cd /lib" and descend into the "directory" that contains only library files, grouped into subdirectories "root", "usr", "local". We would like to "cd /bin|/sbin" and get to the root of the "filesystem tree" that contains only executable files (again, grouped into "subdirectories"). We may even do "cd !src" to get the view of the filesystem without any source files. The Logical File System described in this talk (LISFS for short, not to be confused with the Log File system) can accomplish all that -- now. The prototype implementation is fully functional and reasonably fast. An ls-benchmark shows hardly any performance overhead of far more expressive filesystem queries." He's referring to Logical Information Systems. 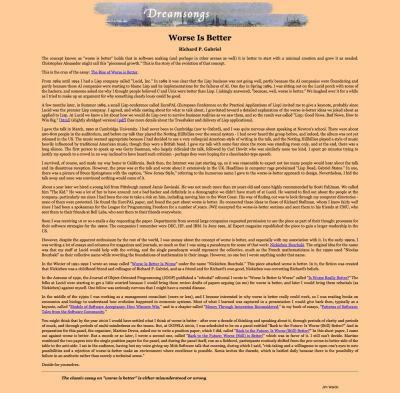 A very nice and personal weblog on using the Tablet PC. Incremental Blogger: "I finally convinced Bryan to play hooky today and see what would happen if he tried to sight-read a fiddle tune off of my NEC LitePad Tablet PC. We downloaded some music in PDF format off the Internet, and tried using a mouse sitting on the floor as a "footswitch" for turning pages." Below are nine thumbnails of some of the more-downloaded pictures from ongoing. (Actually, all the most-downloaded are screen shots, yer a bunch of hopeless geeks, but I digress). Wave your mouse around over them; in any reasonably-modern browser the date and title of the essay the picture's attached to should appear below." 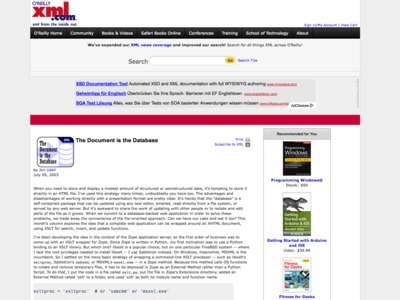 Document formatting: PHP? 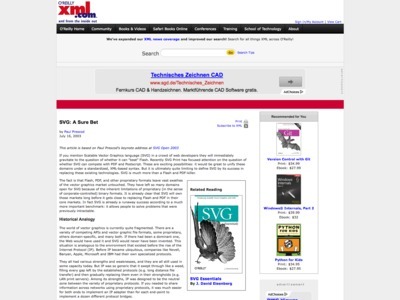 XSLT? CSS? It suddenly clicks: What I always disliked about XSLT was the idea of having to maintain a complex HTML layout in a rather ugly XML file. PHP embedded in HTML is so much nicer to read than HTML embedded in XSL. For a web applications programmer who has to develop complex enterprise level applications, web services or multi language dynamic websites (Content Management Systems), Krysalis is a development platform that improves the Apache/PHP framework by separating the application logic from the presentation layer, using open standards as XML/XSL/SOAP. Unlike any other application servers and frameworks, our platform is an open source solution for productive web development." In the early days of a system, it is a fanclub. You are all happily hacking away. If you break backwards compatibility, so it goes. You change things, they break, you drink a beer, you fix them and move on. This allows for a lot of cool ideas, and also some very stupid ideas. But its all in good fun; and its all about working together with other like minded people on a project you believe in." A List Apart: "Assigning accesskeys to menu items adds “Hot-Key” functions to a website, letting frequent users spend less time less time moving and clicking the mouse. This solution, however, has been largely underused because it almost always fails due to two major flaws. The first problem is that visitors to your website have no way of knowing that you’ve assigned accesskey attributes to your linked elements. Even if they suspect you have, they would have to guess which accesskeys assignments you’ve created. 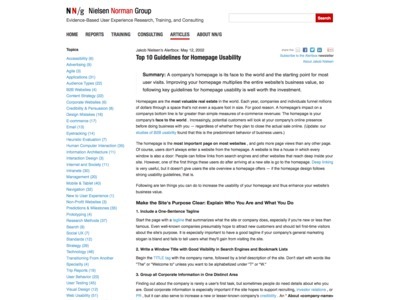 In this article, we’ll look at how to solve this problem, enabling you to clearly but unobtrusively let your visitors know which accesskeys correspond with the links on a page." Here are the free Red Hat 9 ISO images. David Simpson: "I've been an Apple customer since I bought my 128K Macintosh in 1984, and I make my living performing Solaris and Windows system administration in my role as an Oracle DBA. So it's been very exciting for me to see the introduction of Mac OS X and now the availability of Oracle 9i on Mac OS X." Dion Almaer: "Wiki is now everywhere. I can have an easy to edit version of my life, and a lovely trail of all that is important. The web has come to an application, and it is EXTREMELY easy to use." Paul Prescod on XML.com: "Do you want to view a chess transcript without installing a ChessGML viewer? You can do that with SVG. Do you want to visualize the output of a geospatial analysis program? You can do that with SVG. Do you want to visualize different aspects of the London underground? SVG. Want to generate graphics in C#, tweak them in Python and view them in Java's Swing? SVG." Eclipse and WebStudio - The best IDE for PHP ever. Danny O'Brien: "Ever since I saw the Remembrance Agent , I've wanted something like Dashboard. It just seems to be the right idea for me, and I think for others too. It's what I liked about Lotus Agenda ; it's what I anticipate liking about Chandler." "One of my big bones with MS stuff is that it always makes me feel like I'm eating out of the trash bins outside a cubicle farm. All of their software is designed to help busy executives plan their lives. Everyone I know uses it to try and write birthday cards and chat with their friends. When people use Microsoft Office they use it anywhere but in an office." CVS Frontends are getting better finally? Dion Almaer: "What cool CVS clients do you guys use... and what do you think about the state of version control?" csszengarden.com is next to incredible - I wouldn't have thought that CSS is so powerful! "There is clearly a need for CSS to be taken seriously by graphic artists. The Zen Garden aims to excite, inspire, and encourage participation. To begin, view some of the existing designs in the list. Clicking on any one will load the style sheet into this very page. The code remains the same, the only thing that has changed is the external .css file. Yes, really." Layered components - intermediaries, such as proxy servers, cache servers, gateways, etc, can be inserted between clients and resources to support performance, security, etc." Richard P. Gabriel: "The concept known as “worse is better” holds that in software making (and perhaps in other arenas as well) it is better to start with a minimal creation and grow it as needed. Christopher Alexander might call this “piecemeal growth.” This is the story of the evolution of that concept." Jon Udell: "When you need to store and display a modest amount of structured or semistructured data, it's tempting to store it directly in an HTML file. I've used this strategy many times; undoubtedly you have too. The advantages and disadvantages of working directly with a presentation format are pretty clear. It's handy that the "database" is a self-contained package that can be updated using any text editor, emailed, read directly from a file system, or served by any web server. But it's awkward to share the work of updating with other people or to isolate and edit parts of the file as it grows. When we convert to a database-backed web application in order to solve these problems, we trade away the convenience of the file-oriented approach. Can we have our cake and eat it too? This month's column explores the idea that a complete web application can be wrapped around an XHTML document, using XSLT for search, insert, and update functions." 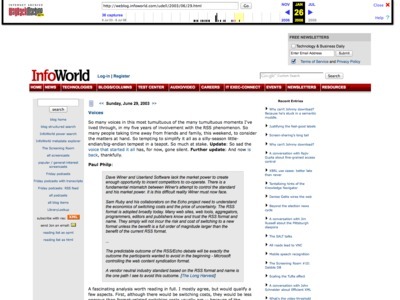 "TikiWiki is an open source web application which provides a full Wiki environment, as well as Articles, Sections, User/Group Management (including optinal LDAP interaction), Polls and Quizzes, File and Image Galleries, Forums, Comments on many areas, Weblogs, and much more." "The night that divides the two days of tutorials from the three-day conference at the fifth annual O'Reilly Open Source Convention is reserved for the States of the Union addresses. Luminaries from the open source communities of Perl, Python, PHP, MySQL, Apache, and Linux each spoke for just under a half hour to present their take on the current state of their technology and where it is headed." 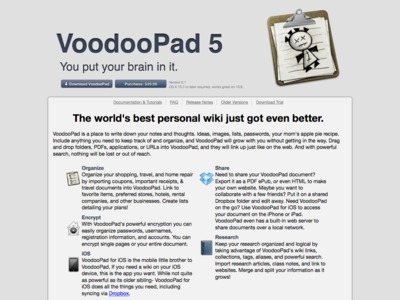 "VoodooPad is a new kind of notepad. It's like having your own personal hypertext library, where you can jot down notes, web addresses, to-do lists... Anything on your mind. VoodooPad automatically links each page together, to form a miniature world wide web, on your desktop! Anybody familiar with the WikiWikiWeb will feel right at home with VoodooPad." Google News - finally. Seems to be just what I've been waiting for. OpenGroupware.org's mission: "To create, as a community, the leading open source groupware server to integrate with the leading open source office suite products and all the leading groupware clients running across all major platforms, and to provide access to all functionality and data through open XML-based interfaces and APIs." Strategic Developer: "The first server I connected to the Internet sat on the floor of my office, close enough so I could hear -- and feel -- its response to heavy load. It seems weird to admit that I relied on those sensory cues, but I've talked to enough system administrators to know I'm not alone." 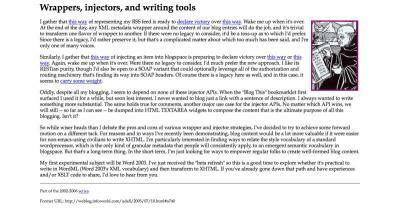 Jon Udell: "[...] blog content would be a lot more valuable if it were easier for non-emacs-using civilians to write XHTML. I'm particularly interested in finding ways to relate the style vocabulary of a standard wordprocessor, which is the only kind of granular metadata that people will consistently apply, to an emergent semantic vocabulary in blogspace. But that's a long-term thing." "Gizmodo is [...] dedicated to everything related to gadgets, gizmos, and cutting-edge consumer electronics." I'd like to have overLIB popups looking like comic strip bubbles - to display footnotes, explain acronyms, and allow multiple link destinations. "[Jabber] is also good at detecting the presence of people AND machines (think of a buddy list for an app that can open a connection to a Jabber server, or to you personally)"
It's been years now since I last looked at how to generate PHP API documentation in HTML directly from the sources. I came to use PHPDoc - which worked after some hacks, but wasn't really nice. Commercial software and not available yet, but nice looking! "CONESYS, the COntent NEtwork SYStem, provides Open Source Software for Peer-to-Peer Content and Knowledge Management." Ray Ozzie: "What will it be like to build applications for a world in which mobility is of primary importance? The three principal dimensions that must be considered are usage mobility and infrastructure mobility and participant mobility." I always thought that the "Publish" function required a lot of magic on the server to work, but never bothered to give it a try (and used ssh + vi for even the smallest changes to my website). - added "Script PUT /publish/put.php" to my httpd.conf, - wrote a small PHP script reading the name of the edited file from $_SERVER[ 'PATH_INFO' ], then doing what's described in the PHP manual. 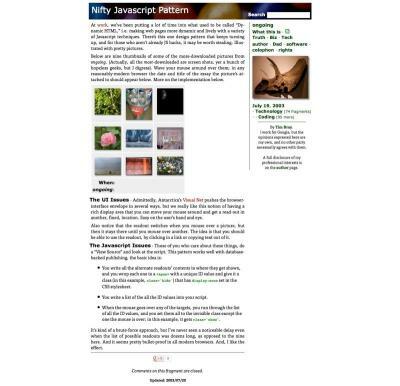 Morphon looks similar to XMLSpy, but it's free (and written in Java). Tim O'Reilly: "We ought to be able to have the expectation that all applications, whether local or remote (web) will be set up for two-way interactions. That is, they can be either a source or sink of online data." "[...] hier können Sie in den Filmen der Wochenschauen kostenfrei recherchieren". "Let me offer a definition of social software, because it's a term that's still fairly amorphous. My definition is fairly simple: It's software that supports group interaction. I also want to emphasize, although that's a fairly simple definition, how radical that pattern is." "Spring is an innovative, web-inspired desktop initially for OS X. It's a universal canvas where you interact naturally with singular, visual representations of the people, places, products, etc that define your life!" Jeff Chan: "[...] I think wikis can learn from outliners. What I would like to see is some form of automated summarization or folding capability which keeps the amount of text per page roughly constant or bounded." "I've been a Wiki (and a Ward Cunningham) fan for years, but I would say that Wiki, too, is suboptimal for the task at hand. Ideally XML, not raw ASCII text, would be the stuff that was written, and refactored, and then mined to produce coherent views. We have no tools that come close to enabling that to happen. Such tools, combining the power of XML with the flexibility of freeform text, and operating on a universal canvas, are what will really drive mainstream adoption of a two-way Web." 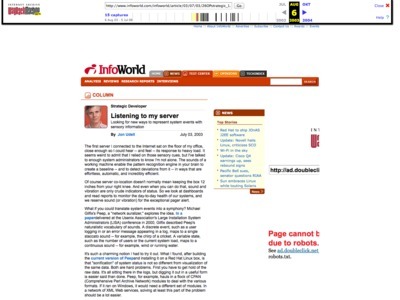 "[...] we're not going to have a semantic web until regular people can effectively write it. Weblogs were a major step forward, [...]"
"I've written recently about finishing work. Jean Paoli has dreamed for half his life of bringing XML to the masses, and he well knows that Microsoft's ability to pour resources into usability analysis and finishing work is his best shot at making the dream real."